You can register here on-line for our classes, or, we still accept phone registration - and any questions you may have! - at 610-689-0068. BERNINA Classroom Machines: We Proudly Provide BERNINA 590E Sewing/Embroidery machines for use. Supply lists will be sent via email or listed directly in class description. Lunch break is about 20-30 minutes. You may bring lunch or a snack. If you wish to leave for lunch, you have several choices close by: Yellow House Hotel - Bridge Inn - Andy Pepper's. Class fee is due upon registration and is for class instruction only - supplies and patterns are extra, unless so stated. If you are interested in using one of our BERNINA machines, please let us know when you register so we can reserve one for you. Porter Service: For those who need assistance, we will carry your machine from your car to the classroom and back. Cancellations: If you cancel your class 8 or more days prior to the beginning of class, a refund will be given. Any cancellations within 7 days of the class are non-refundable unless the class is cancelled due to weather conditions or minimum enrollment is not met. Classes begin at the scheduled time. Please arrive 15 minutes early to give yourself enough time to set up for class. In fairness to fellow classmates, please do not ask the instructor to "catch you up" during class time if you arrive late or miss a class. We also ask you to refrain from wearing perfume on your class day as many people are sensitive to fragrances. Thank you! *Beginner Class These classes are easy. They are geared to an individual who has little to no sewing experience. They require basic straight sewing, very few curves and very little in sewing equipment. *Intermediate Class These classes are geared to the individual who has some very basic sewing skills and has a very basic understanding of sewing terms. They may be challenging to someone with no sewing experience. 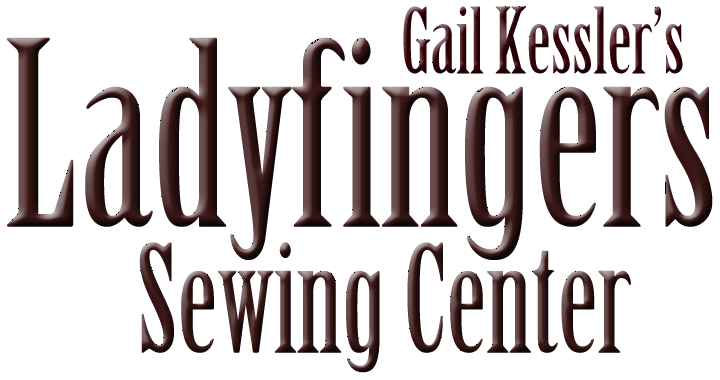 *Advanced Class These classes are for the individual who has a good grasp on sewing, experience with patterns and sewing terms. They have a good supply of equipment and a basic understanding of how to use their equipment. We look forward to having you join us for a fun day of learning and friendship!! Learn how to use your embroidery module for your machine to create this stunning masterpiece. You'll receive over a dozen bonus projects over the course of the class to further enhance your skills as well as grace your home. Meets once a month for 6 months. You may reserve a BERNINA 590E to use during class time by calling Ladyfingers 610 689 0068. A Stitch-in for those interested in catching up on their sewing projects! Receive a $5 coupon to spend on Sew Day. Need a machine? Reserve one from Ladyfingers! Call 610 689 0068 to reserve a seat! All Day! Embroidery modules can do more than embroider. Use yours to create this great cork bag entirely in the hoop. Putting in a zipper has never been so easy. We will also use applique techniques to add pizzazz to the bag. In addition, you will receive directions that will guide you in creating another wristlet with an embroidered motif. Learn new skills, have fun and walk away with a great gift for you or someone you want to surprise. Spend the day with Barbara and create block #1, Apples, from her newest pattern The Orchard. Learn machine applique Barb's way! How to Embroider? Everything Complete 10 Lesson Series - Saturdays Calling all new embroiderers (and experienced ones too). Join Carol for ten months of learning the ins and outs of embroidery. The classes meet once a month over ten months. We?ll practice stitching on different fabrics, old and new techniques, tricks and shortcuts and so much more. We?ll also cover all the great functions of your embroidery machine, how to get out of trouble and how to avoid it. Choose to come to the Thursday classes or the Saturday ones. The classes run 1:00 ? 4:00 with additional suggestions for home projects. This is a skills series, not a project a month program. Learn ?how to? in class and then you decide what you want to create. The cost of $300 includes over 30 hours of instruction and extra bonus surprises. The classes are small (8 people). Learn how to troubleshoot and correct common sewing problems. For new owners or those who desire a refresher, this class shows you the basic features and functions of your BERNINA. Join us for a fun morning of exploring the visual beauty of the Patchwork of the Crosses blocks. Learn to do the English paper piecing technique (hand sewing), and apply it to these blocks. You will add your own individual creativity and flair to make one block using the fabrics, tools and techniques that are available to us today. For new owners or those who desire a refresher, this class shows you the advanced features and functions of your BERNINA. Machine Embroidery - Cutwork Lace Imagine your holiday table set with these elegant napkins or gift them to the wonderful person who invites you to dinner. The lace gives the impression that you worked for hours, but they are easy to make with your embroidery module. You will also learn how to make mitered napkins and how to add other designs to your napkins. Great items for any table or any holiday. For new owners or those who desire a refresher, this class shows you the embroidery features and functions of your BERNINA. Just in time for the Holidays. Another gorgeous Sarah Vedeler Embroidery Project. Create this stunning Christmas Tree Wall Hanging. Come join us for a quilt workshop to expand the boundaries of your skills and creativity. 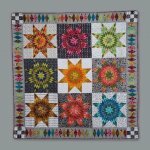 Learn to turn out a variety of dazzling Lone Stars that match at the corners and lay flat! ALL Levels | Challenging and exquisite, The New York Beauty quilt should be on everyone's list! 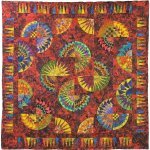 Make your quilt as original as you with Sarah's help and expertise. Explore your creativity with the BEST! How to Embroider? Everything Calling all new embroiderers (and experienced ones too). Join Carol for ten months of learning the ins and outs of embroidery. The classes meet once a month over ten months. We?ll practice stitching on different fabrics, old and new techniques, tricks and shortcuts and so much more. We?ll also cover all the great functions of your embroidery machine, how to get out of trouble and how to avoid it. Choose to come to the Thursday classes or the Saturday ones. The classes run 1:00 ? 4:00 with additional suggestions for home projects. This is a skills series, not a project a month program. Learn ?how to? in class and then you decide what you want to create. The cost of $300 includes over 30 hours of instruction and extra bonus surprises. The classes are small (8 people). How to Embroider? Everything Complete 10 Lesson Class - Thursdays Calling all new embroiderers (and experienced ones too). Join Carol for ten months of learning the ins and outs of embroidery. The classes meet once a month over ten months. We?ll practice stitching on different fabrics, old and new techniques, tricks and shortcuts and so much more. We?ll also cover all the great functions of your embroidery machine, how to get out of trouble and how to avoid it. Choose to come to the Thursday classes or the Saturday ones. The classes run 1:00 ? 4:00 with additional suggestions for home projects. This is a skills series, not a project a month program. Learn ?how to? in class and then you decide what you want to create. The cost of $300 includes over 30 hours of instruction and extra bonus surprises. The classes are small (8 people).